Josh and Jason Sweet inside the space that will house their new brewery and restaurant. Two brothers, Josh and Jason Sweet, plan to open a new brewery and restaurant in the vacant building on Lee Road that was long occupied by Lemon Grass Thai Cuisine. Lemon Grass closed in March 2015, and the large space has stood empty ever since. 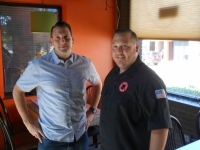 The brothers purchased the building in June, and hope to open Boss Dog Brewing by the end of 2016. Their plan is to sell their own beer at the restaurant, and also distribute it to other restaurants on the East Side. Jason came up with the brewery’s name, and Josh explained, “We are both animal lovers, and we both are big dog lovers, so that's why we decided to name it Boss Dog." The Sweet brothers were born in Cleveland Heights, and both of their parents graduated from Cleveland Heights High School. When Josh was 4 and Jason was 2, their parents divorced, and the brothers moved to New York with their mother, where they grew up. Because their father had remained in the Cleveland area, they came back frequently to visit him. Around 11 years ago, their mother decided to move back to Cleveland, and bought a house on Fairfax Road in Cleveland Heights. A few years later, Josh and Jason decided to come back to Cleveland, and bought a duplex on the corner of Westminster and Kensington roads in Cleveland Heights. Around that same time, the two brothers started getting into brewing. Jason got a brewing kit as a Christmas present, and became hooked on making beer. “I wanted to find something I was 100 percent passionate about, and once I got into brewing, I could not shake it,” Jason said. “We could make the beer right on our stove.” He decided he wanted to find a job in brewing, and he started calling Fat Head’s Brewery every week. “After about eight months of calls, I finally got a job with them in Middleburg Heights,” Jason said. “I started from the ground up, and I learned everything about making beer.” He worked at Fat Head’s for about three years before he left to work on opening his own restaurant and brewery. They think the former Lemon Grass spot is the perfect place for their brewery and restaurant. Josh, now 42, lives in Solon, and Jason, who’s 40, lives in Lyndhurst. Both are married, and Josh has two children, a 3-year-old girl and a 7-month-old boy. Jason’s wife gave birth to a newborn baby boy on July 25.